Preseason games are less about scoring and wins or losses than they are about giving teams a chance to evaluate their personnel. 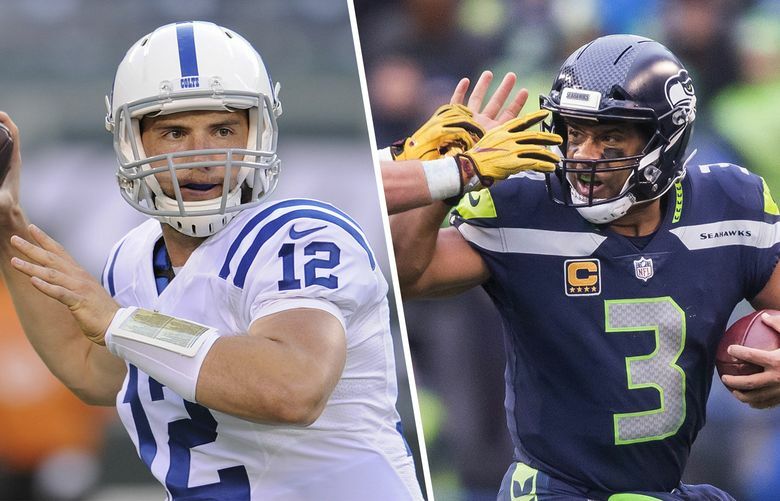 Here's what to look out for what the Seahawks and Colts face off in Seattle's first preseason game of the 2018 season Thursday night. Preseason NFL games aren’t so much about the result on the scoreboard. What’s more important are the little battles conducted along the way as teams try to sort through what they have on their roster and players strive to show they belong. As the Seahawks open their 43rd preseason Thursday night against the Colts at CenturyLink Field, here are a few things worth watching. Richard Sherman is gone, Kam Chancellor is out for the year if not his career, Earl Thomas is holding out and the one remaining Legion of Boom founding member on the current active roster — Byron Maxwell — is nursing a groin/hip injury. That means the Seahawks’ starting secondary tonight figures to be strong safety Bradley McDougald, free safety Tedric Thompson and cornerbacks Shaquill Griffin and Tre Flowers — the latter a fifth-round pick still making the transition from college safety. Other possible replacements if Maxwell is out such as Neiko Thorpe, Trovon Reed and Dontae Johnson have also been battling injury issues and appear likely out for Thursday night. Justin Coleman will be the nickel. The Colts, meanwhile, have said quarterback Andrew Luck will play almost a quarter in what will be his first game since the 2016 regular season. (Luck has been battling a shoulder injury.) Who knows for sure what Luck will be like after such a layoff. But if he’s anything close to his usual form, then he has some good targets to throw to in T.Y. Hilton and Ryan Grant who could give the Seahawks a lot of “information’’ — as coach Pete Carroll so often refers to it — about the reshaped secondary. The Seahawks have used the same five as the number one offensive line throughout camp: Left tackle Duane Brown, left guard Ethan Pocic, center Justin Britt, right guard D.J. Fluker and right tackle Germain Ifedi. The Seahawks have stated that while there’s always competition, they’d be fine if those five could solidify things and allow the line to build plenty of cohesion and continuity heading into the regular season. The biggest question there is suddenly Ifedi, who was benched during a mock game last Saturday after committing two penalties and then demoted to the second team for the final series of Tuesday’s practice as apparent punishment for another false start penalty. Ifedi’s issues came as the Seahawks began giving rookie Jamarco Jones snaps at right tackle after he had played solely left earlier, and Carroll says Jones has been one of the pleasant surprises of training camp. Ifedi, though, remains the starter for now, and while the reports of his struggles have led to a rising cry from fans clamoring for change, the reality remains that the only other apparent options at the moment are a rookie (Jones) or two vets with little game experience (Isaiah Battle, Willie Beavers). For now, the team is leaving George Fant at left tackle as he works his way back from knee surgery a year ago. Still, it’s obvious the team’s patience with Ifedi is wearing thin and additional penalties/mistakes in the preseason will only shorten the leash. The game will be the first chance for the Seahawks to get a look in game action at the league’s new rules on kickoffs. Two of the most basic changes of the rules are that the players on the kickoff team cannot get a running start — they have to line up within at least one yard of the ball at kickoff — and the receiving team has to have eight players lined up within 15 yards of where the ball is kicked off with only three allowed deep and no wedge blocking allowed. That has led to the thinking that teams may line up three potential returners deep, with Seattle potentially pairing Lockett with two others capable of returning, such as first-round pick Rashaad Penny. 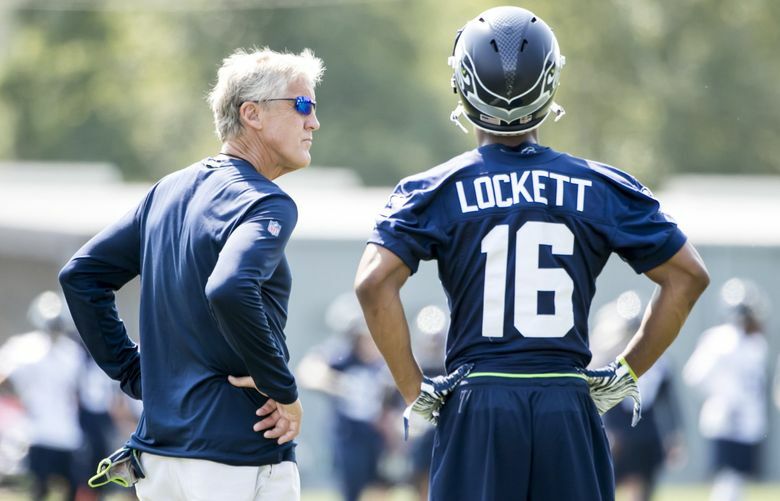 Lockett this week downplayed the impact of the new rules. Two of the most fascinating position battles are at kicker (Sebastian Janikowski, Jason Myers) and punter (Jon Ryan, Michael Dickson). Carroll has said all will get their chances in preseason games, though he didn’t specify exactly how they will rotate. Janikowski and Dickson have emerged as even bigger favorites to win the jobs over the past week. But the Seahawks will pay particular attention to how Dickson, a rookie, handles NFL punting. Also worth watching are the kicking batteries. The punter will also have to be the holder and it’s thought Ryan has a significant edge there on Dickson. Ryan has more often held for Janikowski in camp but if Dickson is going to be the punter and Janikowski the kicker, at some point the two will have to get comfortable in game situations. Who’s catching on at receiver? There are intriguing position battles galore. But few seem as unsettled as the last couple of receiver spots. Doug Baldwin won’t play and Brandon Marshall figures to see sparing action while Lockett and veteran Jaron Brown also are likely to play only a series or two. That means lots of snaps and potential touches for a bevy of young players trying to make a statement, such as Marcus Johnson, Keenan Reynolds, David Moore and Damore’ea Stringfellow (with it unclear if second-year player Amara Darboh will play after he was held out of practice this week).